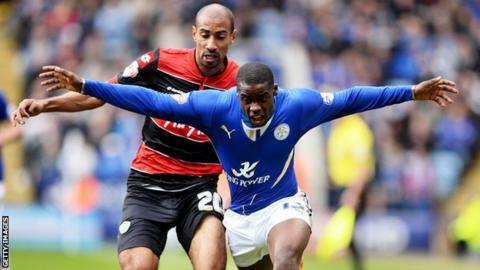 Leicester defender Jeffrey Schlupp was one of three players dropped as Ghana named their final World Cup squad. The 21-year-old was named in the Black Stars' preliminary 26-man squad, but performed poorly in a 1-0 friendly defeat by the Netherlands on Saturday. Helsingborgs striker David Accam and Turkey-based Jerry Akaminko, who broke a fibula in Rotterdam, also miss out. Middlesbrough winger Albert Adomah is the only player based in England to make the squad. Akaminko's injury leaves Ghana short on defensive options, but coach Kwesi Appiah could play Michael Essien at centre-back and Kwadwo Asamoah at left-back if required. Asamoah and Essien are two of the eight players in the squad with previous World Cup experience, while Asamoah Gyan and Sulley Muntari will play at their third straight finals. The retention of Andre and Jordan Ayew - sons of local legend Abedi 'Pele' Ayew - means Ghana's most famous football family will be represented for the second World Cup in a row. Ghana's final preparations started in Accra on 20 May, and the squad now head to the United States. The Black Stars' final friendly will be against South Korea in Miami before the team arrive in the Brazilian city Maceio on 11 June, five days before they face the United States. Germany and Portugal complete Group G.
Goalkeepers: Fatau Dauda (Orlando Pirates), Adam Kwarasey (Stromsgodset), Stephen Adams (Aduana Stars). Defenders: Samuel Inkoom (Platanias), Daniel Opare (Standard Liege), Harrison Afful (Esperance), John Boye (Rennes), Jonathan Mensah (Evian), Rashid Sumalia (Mamelodi Sundowns). Midfielders: Michael Essien (AC Milan), Sulley Muntari (AC Milan), Rabiu Mohammed (Kuban Krasnodar), Kwadwo Asamoah (Juventus), Emmanuel Agyemang-Badu (Udinese), Afriyie Acquah (Parma), Christian Atsu (Vitesse), Albert Adomah (Middlesbrough), Andre Ayew (Marseille), Mubarak Wakaso (Rubin Kazan). Forwards: Asamoah Gyan (Al Ain), Kevin-Prince Boateng (Schalke 04), Abdul Majeed Waris (Valenciennes), Jordan Ayew (Sochaux).